Each winter, wide swaths of the Arctic Ocean freeze to form sheets of sea ice that spread over millions of square miles. The Arctic ice cover reaches its peak each year in mid-March, before shrinking with warmer spring temperatures. But over the last three decades, this winter ice cap has shrunk: Its annual maximum reached record lows, according to satellite observations, in 2007 and again in 2011. Understanding the processes that drive sea-ice formation and advancement can help scientists predict the future extent of Arctic ice coverage -- an essential factor in detecting climate fluctuations and change. But existing models vary in their predictions for how sea ice will evolve. Through their model, the researchers identified an interaction between sea ice and ocean currents that is important for determining what's called "sea ice extent" -- where, in winter, winds and ocean currents push newly formed ice into warmer waters, growing the ice sheet. Furthermore, springtime ice melt may form a "bath" of fresh seawater more conducive for ice to survive the following winter. Accounting for this feedback phenomenon is an important piece in the puzzle to precisely predict sea-ice extent, says Patrick Heimbach, a principal research scientist in MIT's Department of Earth, Atmospheric and Planetary Sciences. "Until a few years ago, people thought we might have a seasonal ice-free Arctic by 2050," Heimbach says. "But recent observations of sustained ice loss make scientists wonder whether this ice-free Arctic might occur much sooner than any models predict … and people want to understand what physical processes are implicated in sea-ice growth and decline." 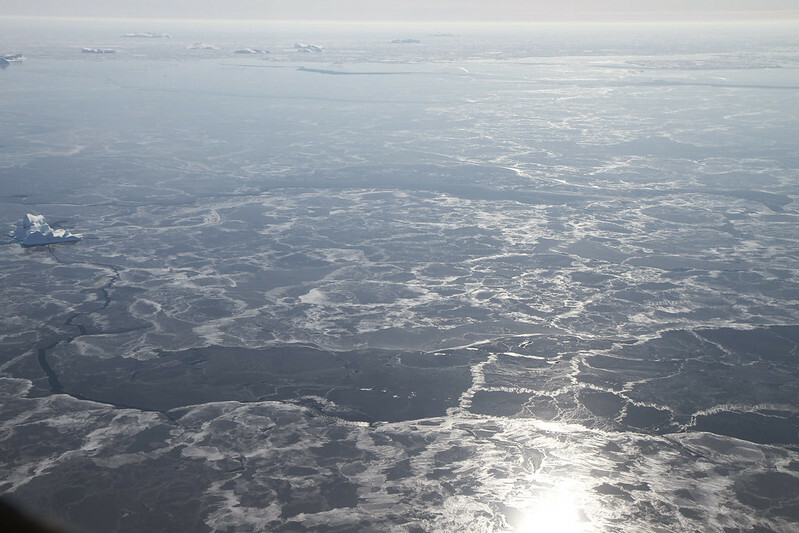 Heimbach and former MIT graduate student Ian Fenty, now a postdoc at NASA's Jet Propulsion Laboratory, will publish a paper, "Hydrographic Preconditioning for Seasonal Sea Ice Anomalies in the Labrador Sea," in the Journal of Physical Oceanography. As Arctic temperatures drop each winter, seawater turns to ice -- starting as thin, snowflake-like crystals on the ocean surface that gradually accumulate to form larger, pancake-shaped sheets. These ice sheets eventually collide and fuse to create massive ice floes that can span hundreds of miles. Heimbach and Fenty constructed a model to simulate ice cover, thickness and transport in response to atmospheric and ocean circulation. In a novel approach, they developed a method known in computational science and engineering as "optimal state and parameter estimation" to plug in a variety of observations to improve the simulations. The researchers tested their approach on data originally taken in 1996 and 1997 in the Labrador Sea, an arm of the North Atlantic Ocean that lies between Greenland and Canada. They included satellite observations of ice cover, as well as local readings of wind speed, water and air temperature, and water salinity. The approach produced a tight fit between simulated and observed sea-ice and ocean conditions in the Labrador Sea -- a large improvement over existing models. Knowing that this model fits with observations suggests to Heimbach that researchers may use the method of model-data synthesis to predict sea-ice growth and transport in the future -- a valuable tool for climate scientists, as well as oil and shipping industries. "The Northwest Passage has for centuries been considered a shortcut shipping route between Asia and North America -- if it was navigable," Heimbach says. "But it's very difficult to predict. You can just change the wind pattern a bit and push ice, and suddenly it's closed. So it's a tricky business, and needs to be better understood." "The dynamics of climate are complicated and nonlinear, and are due to many different feedback processes," says Losch, who was not involved with the research. "Identifying these feedbacks and their impact on the system is at the heart of climate research." As part of the "Estimating the Circulation and Climate of the Ocean" (ECCO) project, Heimbach and his colleagues are now applying their model to larger regions in the Arctic.